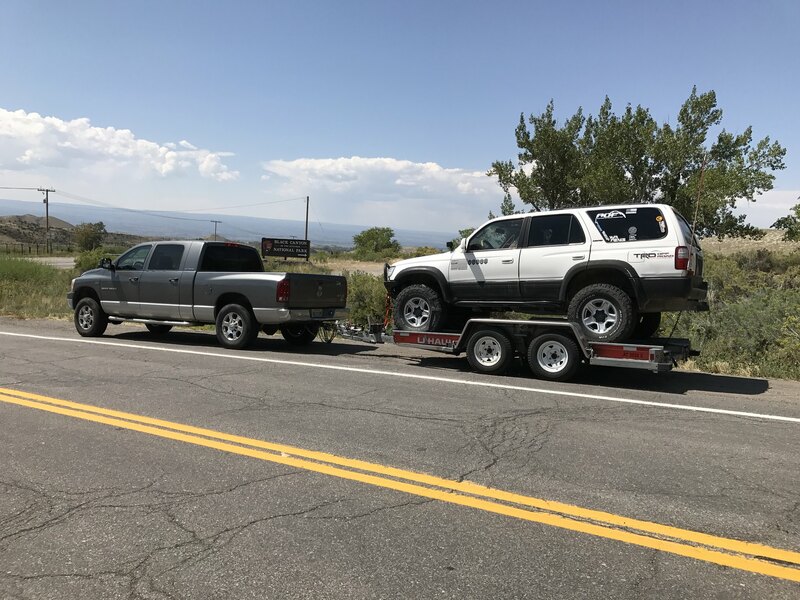 When my old 4Runner broke down on a Overland trip, it got about 8-9 towing it back through the mountains. Diggin this build so far.. Sweet. Gotta follow this one. Well done. Thanks man! Gonna slow down a bit in the winter since I don't have a garage. Kind of hard to work on her in the cold/snow with no garage. Honestly couldn't really complain too much. The 4Runner stuck out a lot over the roof line and wasn't exactly aerodynamic. I wish she was a Cummins but we got the truck for free when my wife's dad upgraded to a 16 Cummins. I am hoping gears will bump the mileage up a little bit. I do love the look of your truck. And free is the best. Thanks! If you get the option of a Cummins jump on it. Great Motors. One of my neighbors has one and for the first 2 years he owned it I thought it was a 2500 based on the solid front axle, but then I noticed the 1500 on the door a few months back and had to google it to read up, pretty cool setup for sure. They made the "1500" Mega Cab for only 2 years(06-08), once they went to the 4th Gen Rams they were all 2500's. 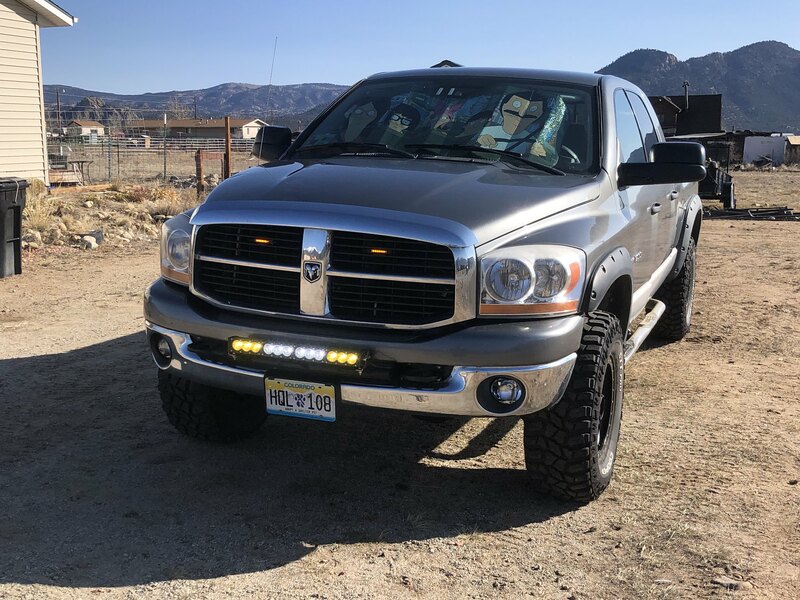 From what I gathered the only difference was the rear suspension was softer and the 1500 got the 5.7 Hemi and the 2500's the Cummins. Everything else on the truck is a 2500. I believe the 2500 also had the option of the 6.4 Hemi. Our GMC Yukon 2500 is kind of in the same boat, has all of the 2500 brake and trans upgrades but has the small block 6.0 under the hood, the 8.1 big block was an option and tows like a diesel but holy cow they guzzle the gas. 6.4 didn’t come out till 2014 for the heavy duty Rams. Very cool truck. It's good to see more and more 3 Gen builds. Yes, 3 Gen MegaCabs was a weird truck and came as 1500, 2500, 3500 SRW and 3500 DRW. Basically first three were the same trucks except engine and rear springs. So basically you have a Heavy Duty truck minus diesel. It is true, 5.7 was the only gas engine offered at that time in Mega Cab. 2006 and early 2007 got 5.9 Cummins and 2007.5 and up got 6.7 Cummins. 2007 was a transition year for diesel emissions. I still have my 06 5.9 Cummins MegaCab that i got brand new. Was thinking about trading it couple of times (new trucks are nice) but just can't do it. Its been a great truck. If you are not towing much then that 5.7 will serve you well. I would also add steering brace to your upgrade list if you don't have one yet. It will help keep things in place especially with larger tires. This is considered a must by many to keep everything happy and was one of the first mods I did to my truck. Here is pic of my old girl. The 6.4L didn't come out till the 4th Gen trucks, not sure of the exact year. I have heard the 6.4L is a nice since it doesn't make it's power so high in the RPM band like the 5.7 Hemi does. The 3rd Gen Mega Cabs are definitely interesting the way Dodge initially released them. 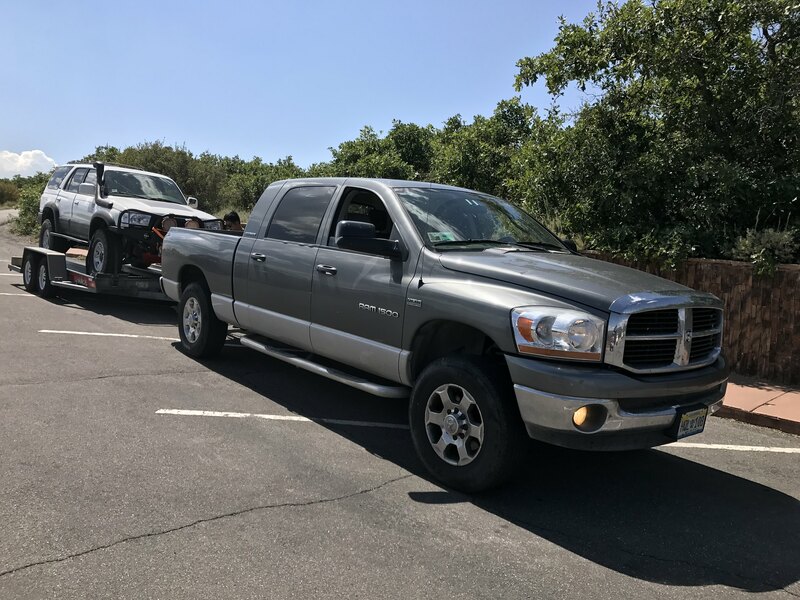 I love the truck so far and the only towing I do is towing wood from one property to the next. May eventually get a small trailer for designated camping grounds. I definitely want to upgrade the steering to the newer style, I've heard that is a big improvement. I will look into the steering brace as well. Those 5.9L Cummins are beast! I would definitely keep it. Good thing about the 5.9L is less emissions stuff to go wrong with it. I don't really follow Ram variations, just saw the "6.4 Hemi" on the side of one of the Ram 2500 fleet vehicles they use around here, should be a decent option if you don't need a diesel. The 6.4L is a good motor, definitely an upgrade over the 5.7. The 6.4L doesn't make much more power but it does make it lower than the Hemi. The downside to the 5.7L when towing is that you need to be in the upper RPM range. 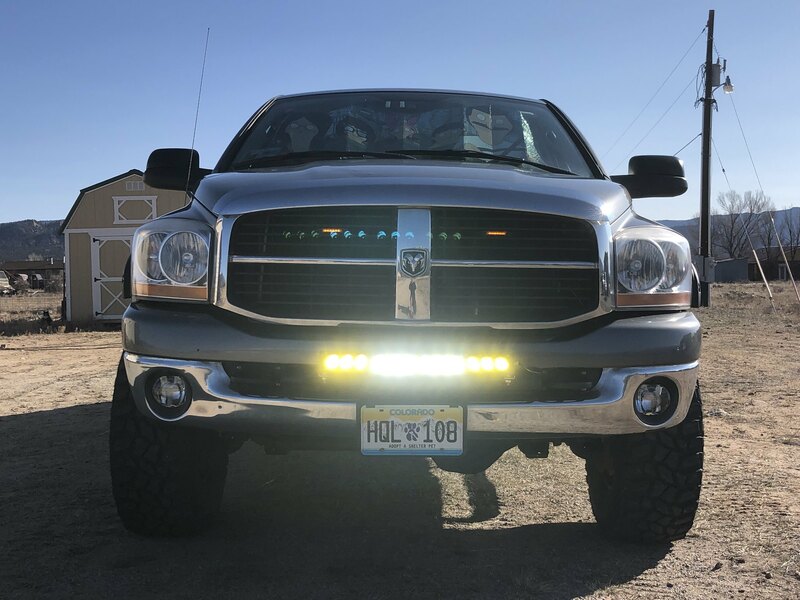 Got the light bar mounted and mostly wired up. Still waiting for my switch panel to be worked up. 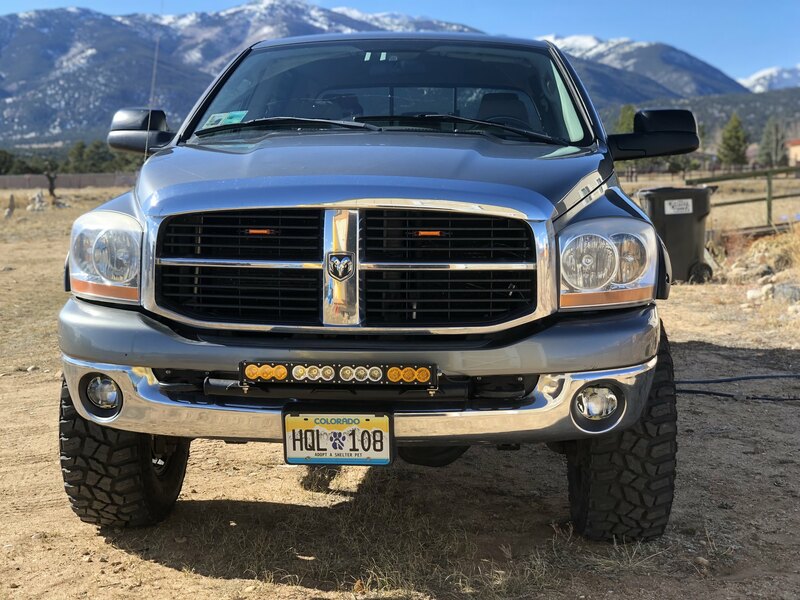 I got the light bar as centered as possible on the bracket. Looks good! Hopefully you're also happy with the output come night time. (Sidebar; also love the Bob's Burgers sunshade, hah). I will hopefully be able to test it out soon. My wife stole my Rick and Morty one, so Bob's Burger is the next best thing.